The best days in May are clearly it's eponymous holiday (the 1st), Star Wars Day (the 4th), and Cinco de Mayo (duh, this should be obvious), as well as any day you hit one of the 10 can't-miss Seattle events below... assuming you're not too busy picking up power converters at Tosche Station, or doing something else awesome. 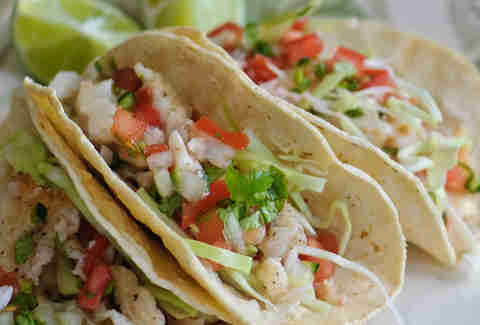 Taco Libre Showdown From 5-11pm in the International District, more than 20 local taco trucks will duke it out for soft-shelled glory. The winner is selected by you, discerning taco fan, and admission is free, so by all means, go nuts on the carnitas while being serenaded by on-site mariachi bands. Ay caray! Taco Libre Showdown International District From 5-11pm in the International District, more than 20 local taco trucks will duke it out for soft-shelled glory. The winner is selected by you, discerning taco fan, and admission is free, so by all means, go nuts on the carnitas while being serenaded by on-site mariachi bands. Ay caray! Yacht Club Opening Day Check out the races and opening day parade, which famously starts with a canon and the raising of the Montlake bridge. Orrrr you can figure out via social media who has a boat and find out how to get on it, stat. Yacht Club Opening Day Montlake Check out the races and opening day parade, which famously starts with a canon and the raising of the Montlake bridge. Orrrr you can figure out via social media who has a boat and find out how to get on it, stat. 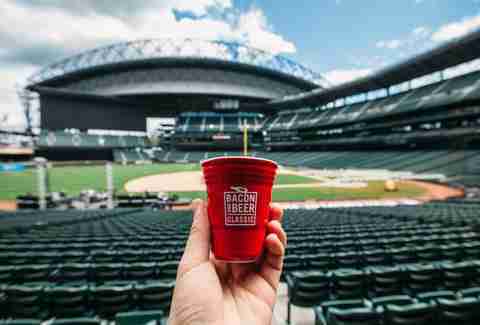 Bacon and Beer Classic This Safeco Field event takes place in two parts -- one three-hour session is from noon-3pm, and the other is from 7-10pm -- and a $59 tickets gets you glorious bacon-based bites from a variety of local restaurants, beer samples from more than 100 craft breweries, and much more. Bacon and Beer Classic Safeco Field This Safeco Field event takes place in two parts -- one three-hour session is from noon-3pm, and the other is from 7-10pm -- and a $59 tickets gets you glorious bacon-based bites from a variety of local restaurants, beer samples from more than 100 craft breweries, and much more. Tillicum Village Salmon Bake and Cruise Where is Tillicum Village, you ask? Hop on a boat and find out during the opening day salmon bake cruise on May 2. Tickets are $79.95 and get you a four-hour escape to Blake Island State Park, complete with a salmon buffet, Salish-inspired programs, and plenty of time to explore the island with a belly full of fish. Tillicum Village Salmon Bake and Cruise 1483 Alaskan Way Where is Tillicum Village, you ask? Hop on a boat and find out during the opening day salmon bake cruise on May 2. Tickets are $79.95 and get you a four-hour escape to Blake Island State Park, complete with a salmon buffet, Salish-inspired programs, and plenty of time to explore the island with a belly full of fish. 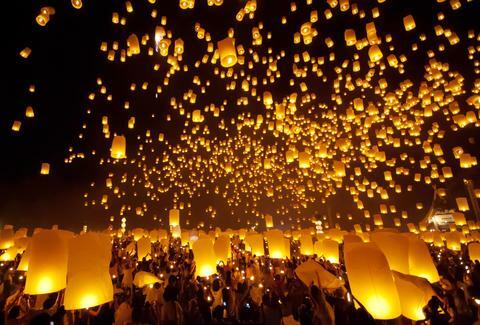 Lantern Festival Ready your smartphone, Shelton’s Lantern Festival is easily the most photogenic event this month. Admission to the exquisitely lit event runs $30 for advance tickets and $40 on the day of and includes a lantern and a s’mores kit. Also on site will be music, dancing, and offerings from local vendors. 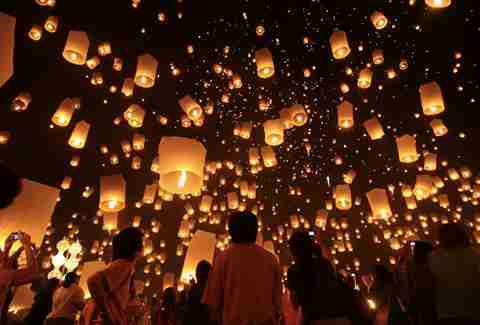 Lantern Festival Ridge Motor Sports Park Ready your smartphone, Shelton’s Lantern Festival is easily the most photogenic event this month. Admission to the exquisitely lit event runs $30 for advance tickets and $40 on the day of and includes a lantern and a s’mores kit. Also on site will be music, dancing, and offerings from local vendors. The Future Is Prom! Want a prom re-do? Head to Linda’s Tavern for its annual prom party. This year’s futuristic theme features DJ Tron Burgundy and DJ Curtis, a makeup booth with TACOCAT, and of course the crowning of the prom king and queen. The Future Is Prom! Linda's Tavern Want a prom re-do? Head to Linda’s Tavern for its annual prom party. This year’s futuristic theme features DJ Tron Burgundy and DJ Curtis, a makeup booth with TACOCAT, and of course the crowning of the prom king and queen. SIFF Celebrate cinema with Seattle’s very own international film festival. The lineup is yet to be released, but rest assured it never disappoints. From forum panels to screenings galore, SIFF is an excellent way to check up on what’s going on in the film world both locally and internationally. You can ponder which pass to purchase here. 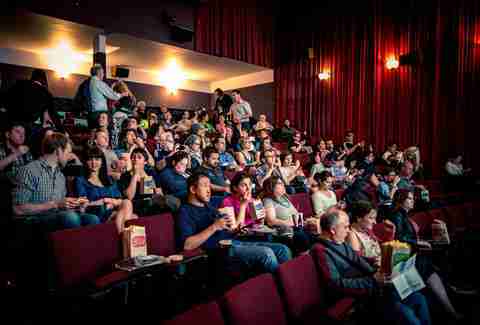 SIFF Multiple locations Celebrate cinema with Seattle’s very own international film festival. The lineup is yet to be released, but rest assured it never disappoints. From forum panels to screenings galore, SIFF is an excellent way to check up on what’s going on in the film world both locally and internationally. You can ponder which pass to purchase here. U-District Street Fair Peruse the Ave from 10am-7pm on Saturday and 10am-6pm on Sunday for the freshest produce and best people watching around. Live music, fair food, and a beer garden will be on site and admission is F-R-E-E. Click here for a full list of on-site vendors. 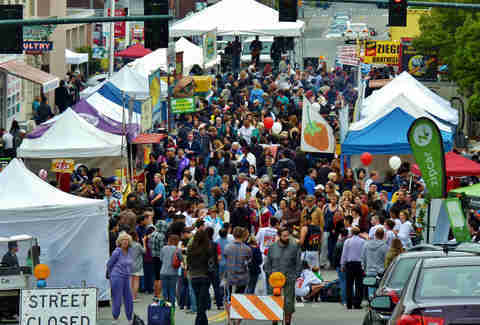 U-District Street Fair U-District Peruse the Ave from 10am-7pm on Saturday and 10am-6pm on Sunday for the freshest produce and best people watching around. Live music, fair food, and a beer garden will be on site and admission is F-R-E-E. Click here for a full list of on-site vendors. Sasquatch! With headliners like Kendrick Lamar, Modest Mouse, and Ryan Adams the show should actually be worth tearing your eyes off the gorgeous backdrop of the Gorge, so pack up your tent and hit the road -- general admission for all four days is $350. Sasquatch! 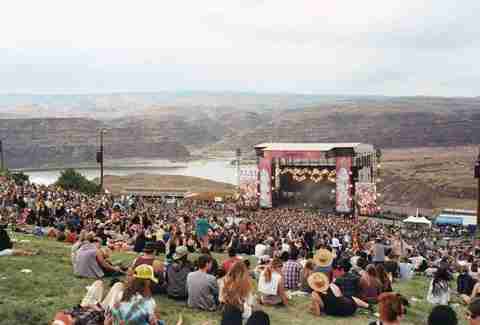 The Gorge Amphitheatre With headliners like Kendrick Lamar, Modest Mouse, and Ryan Adams the show should actually be worth tearing your eyes off the gorgeous backdrop of the Gorge, so pack up your tent and hit the road -- general admission for all four days is $350. Electric Run Here’s your chance to slap on that neon thing you never wear and speed through the night in this one-of-a-kind 5K. The race starts at the Washington State Events Fair in Puyallup at 9pm sharp and takes you through a series of "lands" all lit in spectacular fashion. Tickets are $55 the day of and $49.50 until May 1st. Electric Run Washington State Fair Events Center Here’s your chance to slap on that neon thing you never wear and speed through the night in this one-of-a-kind 5K. The race starts at the Washington State Events Fair in Puyallup at 9pm sharp and takes you through a series of "lands" all lit in spectacular fashion. Tickets are $55 the day of and $49.50 until May 1st.